WHAT IS COMMON RAIL DIESEL AND WHERE ARE FORD COMPONENT MANUFACTURING PRESSINGS FITTED? Electronic control fuel systems were introduced mainly to meet emissions legislation, with common rail systems being introduced to mainline manufacturing in the late 1990’s. Common rail diesel is both electronic and high pressure. Common rail direct fuel injection is a direct fuel injection system for petrol and diesel engines. On diesel engines, it features a high-pressure (2,000 BAR – 29,000 PSI) fuel rail feeding individual solenoid valves, as opposed to a low-pressure fuel pump feeding unit injectors or pump nozzles. Diesel fuel is injected into the engine in very small amounts by electronically controlled injectors. These are controlled by the engine control unit (ECU). 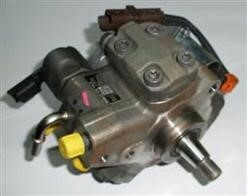 High pressure fuel is provided by a mechanical high pressure pump, mounted on the engine. This high pressure fuel is stored in a reservoir – called the common rail – until it is required by the injectors. Highly pressurized fuel means the diesel is atomized into small droplets. This means better combustion, greater economy, lower emissions and quieter running. All these are features of modern common rail diesel systems. The diesel fuel in a common rail diesel system is always available for the engine to use whatever the engine speed. It is always available and available at high pressure. This means high pressure fuel is available even when the engine is only ticking over i.e. at low revs. Earlier conventional diesel systems, called rotary diesel, are essentially mechanically controlled. How do Ford Component Manufacturing get involved with this diesel system with one of their metal pressed components? Well we must look deep into the bowels of the automotive assembly to see the Copper Washers we press for the automotive industry. An important simple metal pressed part in a complex assembly. High Pressure pump – the high pressure pump is the heart of the fuel system. This is where diesel fuel has it’s pressure increased – it is engine driven, system dependent and can generate in excess of 2,000 BAR – to put this pressure into perspective a common car tyre pressure would be around 2.5 to 3.5 BAR. 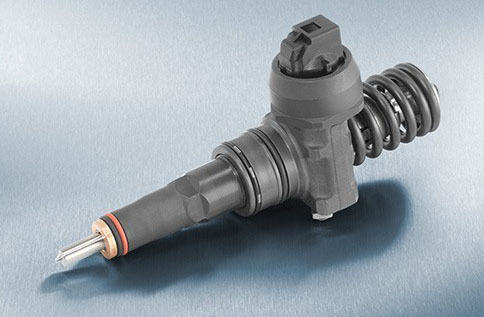 Injectors – the injectors in the common rail system are controlled and operated by the ECM after taking into consideration multiple sensor and signal inputs. The manufacturing tolerances and components remain the same as the high pressure pumps and are critical to the operation and lifespan of the injector. Finally we can see the Copper Washer, a metal pressing made for the Automotive Industry by Ford Component Manufacturing. So why is this pressed washer so important? 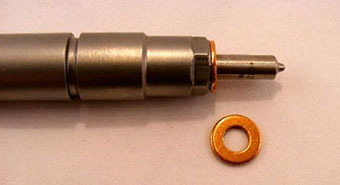 A missing pressed copper washer or improperly torqued injector can allow hot combustion gases into the injector cavity. This will result in failure of the lower fuel O-ring on the injector causing fuel leakage into the combustion chamber when the engine is turned off and hot combustion gases into the fuel system when the engine is running. Combustion gases leaked into the fuel system will result in seizure of the fuel injector’s internal components and multiple injector failure. Since all of the injectors share a common fuel rail within the cylinder head a combustion leak into the fuel system will contaminate all of the injectors. Black soot on the bottom of the injector is a clear indicator that the injector was improperly torqued or the pressed copper washer was missing. Ford Component Manufacturing press them, always make sure you fit them!